The world is different than it was 10 years ago! Twitter, Facebook, blogging, and other aspects of social media have invaded our world with good and bad results. Guiding your teen through the social media maze may seem difficult, but here’s a resource that provides helpful pointers and advice. Biblically Handling Technology and Social Media by Biblical Discipleship Ministries is a small booklet (about 50 pages) that is jam-packed with advice for parents and teens. Reading it with your teen will be very helpful and enable the two of you to determine guidelines for your teens when they interface with many social media outlets. The booklet is not “anti-social media,” rather its purpose is to provide teens with a realistic view of how various social media (including Facebook, texting, iPods, video games, online gaming, e-book readers, Netflix, and other sources) can be a conduit for learning, interacting, and research. Along with these positives, the booklet gives helpful cautions to take into consideration. Throughout the booklet, the authors weave in testimonies, Bible passages, and thoughts to ponder that provide parents with many opportunities for beneficial discussions with their teens. The booklet shares concise strategies in its “Four Basic Principles to Apply to Digital Media, Portable Media Players, and Social Media.” Each principle provides thought-provoking ideas to keep in mind when using these technology tools for God-honoring purposes. 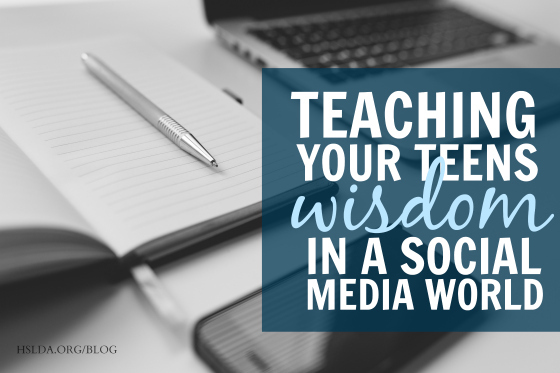 In what ways can your teen use Facebook or blogging to positively affect others? How can your teen be careful not to be a stumbling block to others as they use social media? The booklet suggests ways to interact with others while maintaining Christian character and focus. It provides ideas to take control of the time expended on social media. Although each family will want to think through its personal convictions relating to social media, you’ll find the book clearly outlines areas to consider as you engage your teen. The booklet also provides parents with a good check on their own interactions with social media! You can purchase the booklet here. Photo Credit: Copyright HSLDA, graphic design by Charity Klicka.